1950 Auburn Tigers Stacked At Coed? Florida thought so. 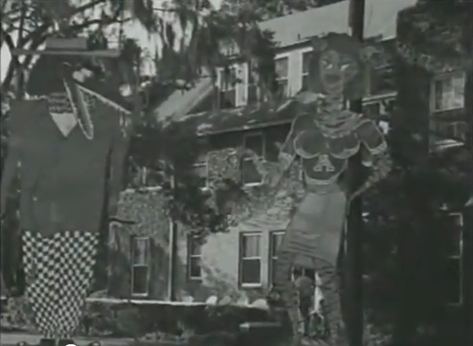 Our team may not have been stacked in Earl Brown’s miserable final year on the Plains, but our coeds apparently were, at least if the decorations seen in this silent government-produced featurette on Florida’s 1950 homecoming festivities are any indication. The fraternity behind the decorations shown below opted not for a Gator-hunts-Tiger safari or an eagle behind bars captioned with some sort of rah-rah pun, but rather what looks to be—you can almost hear the Toon Town ahh-oooga—a zoot-suited gator going gaga over a curvy Auburn tigress. And that’s it. Kind of weird.